FK chats to Brooke who has created cleaver up-cycled green designs with her label Bog Standard Design. 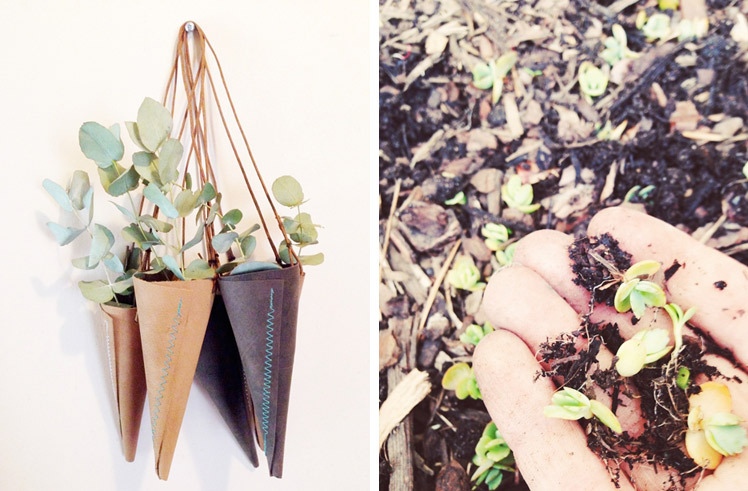 See Brooke’s hanging planters in person at the Brisbane Markets! Tell us about your label Bog Standard Design and what the concept is behind it? Bog Standard Design is all about using what I have on hand to make and create something new. I use off cuts from manufacturing in my craft practice as well as materials that could be considered boring or plain and try to use up those off cuts and waste materials as much as I can to turn them into simple but beautiful objects. I suppose my concept would be simple ideas, minimal waste. I’ve always been a crafter, I was the arty crafty kid, always making and decorating. Five years ago I found myself with a day job in a creative industry working with salvaged materials at a re-use centre and at night I crafted with all the interesting bits and pieces I brought home. This lead to selling my creations and taking on some custom orders, people were liking what I was making and so Bog Standard Design was born! 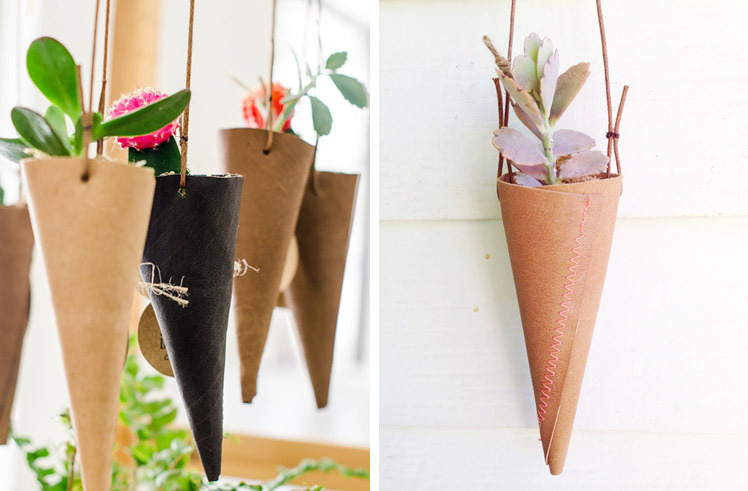 What do you love about creating hanging gardens and what keeps you creatively motivated? Hanging gardens came about as a way for me to display all my little succulent cuttings around the house and in my work room. 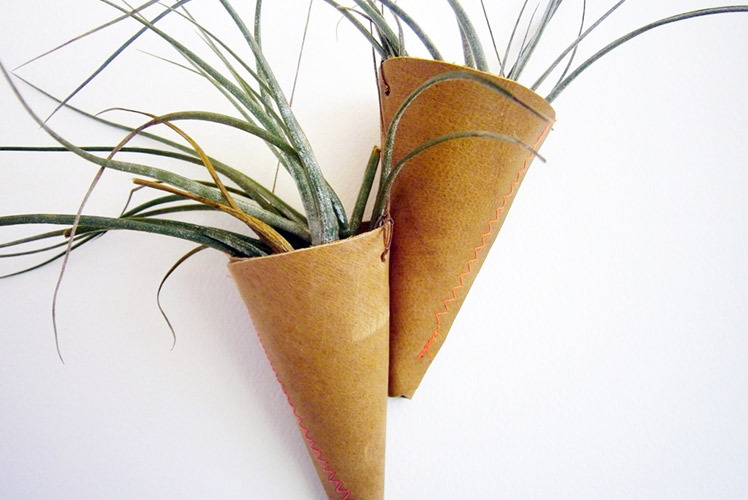 I had some leather off cuts and made up a little hanging vessel to plant a cutting in. 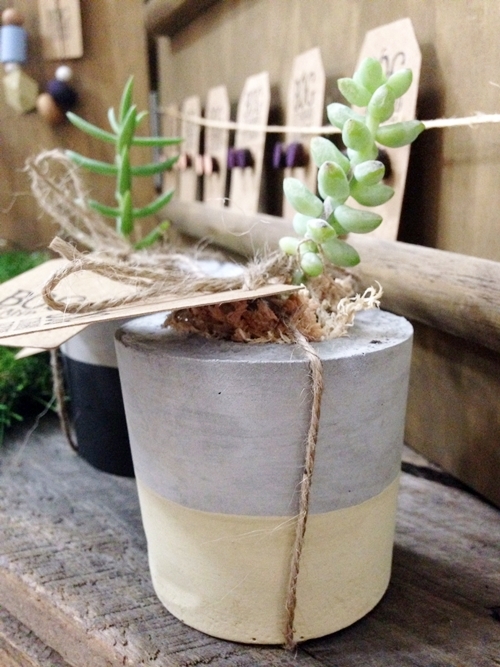 I enjoy making them because I enjoy displaying them, bringing a little bit of greenery into the home in a quirky way. 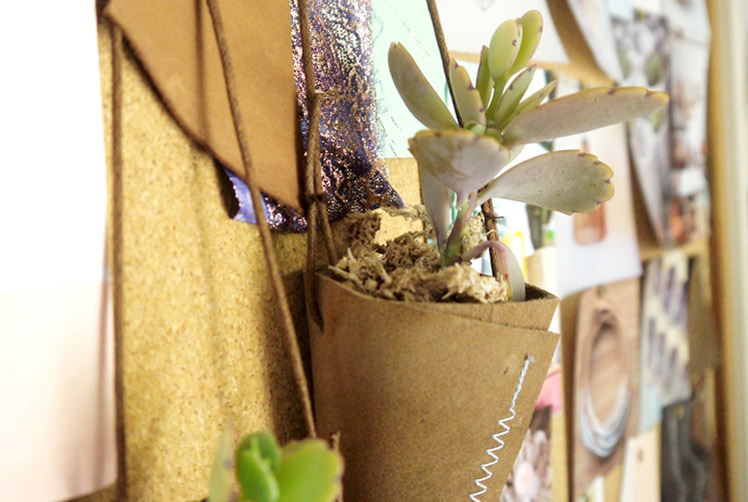 I often hang them on my pin board above my desk, it’s like having an office plant but cuter! 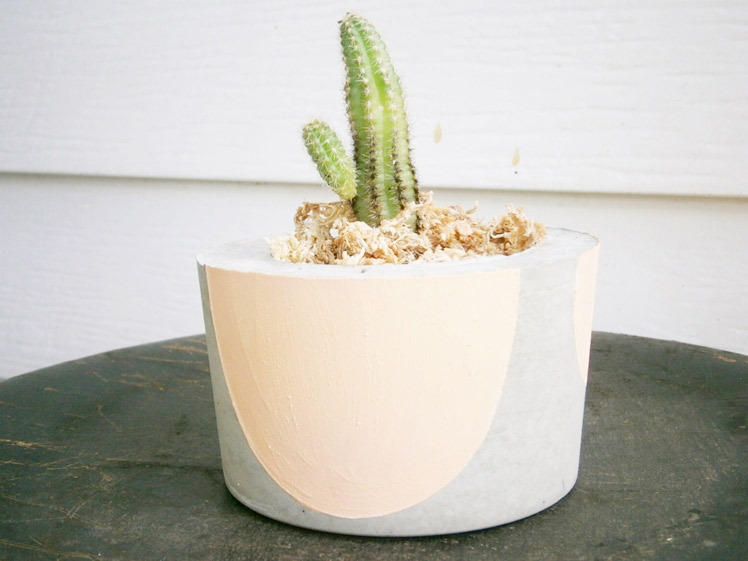 My creative motivation comes from trying new things and experimenting with different materials. I’m playing around with garden sculpture plaster at the moment which is completely different from anything I’ve used before. To be honest I am a messy crafter and my mess extends through most rooms of the house! I do have a space to work in at the back of our house, it’s a small sun room that’s actually quite dark but opens out onto a deck where I keep some of my plants and baby succulents. That works quite well because I can make up the hanging gardens and then plant them up all in the same space. I found a huge second hand cork board that hangs above my desk that I fill with pictures and images that inspire me including images of dream work-spaces. I think I’m more inspired by materials and what I can do or make with them rather than my surroundings. What challenges have you faced starting your label and what are some things you love about it? The challenge with making hanging gardens in particular is that they are difficult to post. I love that people have access to the work of so many talented designers and crafters through online stores and platforms such as Etsy so that’s definitely a challenge for me but being able to bring my wares to markets is what I love about what I do. People can choose a little plant and hanger that they love and take it home and I enjoy that. The question I get asked most at markets is “Is that a real plant?” I like that people can see and touch them in person and also designing and then setting up a little shop at markets is something I love doing as part of having a handmade label. 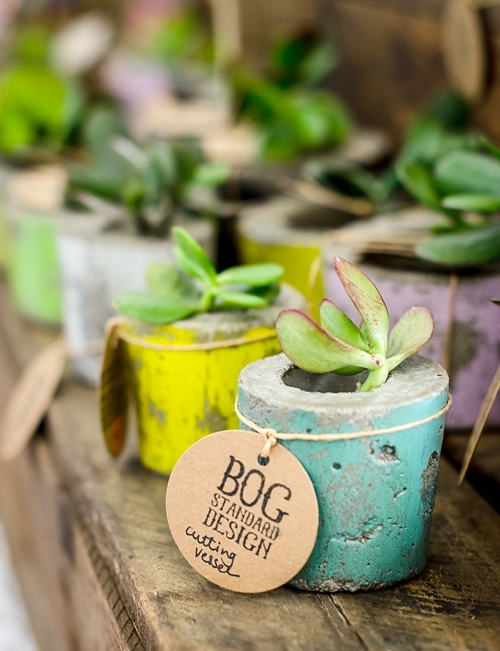 What can we expect to see from Bog Standard Design at the upcoming Brisbane Markets? Lots of green! I’ve been dividing up patches of baby succulents and planting lots of pups and cuttings. I’m hoping to have a bit of a vertical garden wall happening with lots of hanging gardens all planted up and ready for new homes.